Healthy Salad Recipes, Indian Vegetarian Healthy Salad Recipes. Have you had your salad today? Experts say that eating salads almost every day may be one of the healthiest eating habits you can adopt, and thankfully, one of the simplest! Eating salads is a convenient way to work in a couple of servings of vegetables and fruits. Not only that, salads are cool, crunchy and fun to eat with varied textures, colours and flavours. The only problem with salads is that sometimes people add a lot of cream-based, fattening dressings to the good stuff, thinking it is the only way to make it tasty. Ditch this idea and let this section show you how to make super-healthy salads that your taste buds will thank you for! Healthy salads can be of 2 versions. One is healthy salads which are low in fat and on the other hand healthy salads which are high on fat but have healthy fat ingredients. Both these kind of salads are healthy. We all love our salads and here we use low fat ingredietns for those on a low calorie diet. Lets start with cabbage salad recipe which is low in calories and high in fibre. Apple being sweet goes very well in minty apple salad recipe which makes a very quick healthy salad. Pear and pomegranate salad is another example of using sweet fruits cleverly. Sprouts are easy to digest. Sprouting increases the availability of proteins so include them in your salads. Suva is a rich in iron while bean sprouts is high in vitamin c in bean sprouts and suva salad. Sprouts + fruits + curds gives you mixed sprouts fruit and veggie salad recipe. Try our tasty mixed sprouts salad as it contains a mix of different sprouts which is much healthier than a single sprout. Here are some lunch salads which are high in fat and very healthy. They contain good fat like full fat curds, olive oil, almonds, avocado etc. Kale masoor office salad is a mix of carrots, mushroom, cucumber, cabbage and a healthy dressing. Then we have the rocket leaves, zucchini and red pumpkin salad which gives you all the nutrients required. Jowar is a gluten free grain packed with b vitamins, magnesium and calcium to be used in jowar kale palak antioxidant salad recipe. Broken wheat (dalia) is fibre rich, high in magnesium and iron and forms a great base for healthy salads. This broken wheat salad recipe is combined with carrots, tomatoes, mint, spring onion greens and a low fat curd dressing. Broken wheat salad with chick peas recipe has red capsicum and lots of parsely added to it. These salads will keep you full for a longer time due to high fibre and not spike your blood sugar levels. 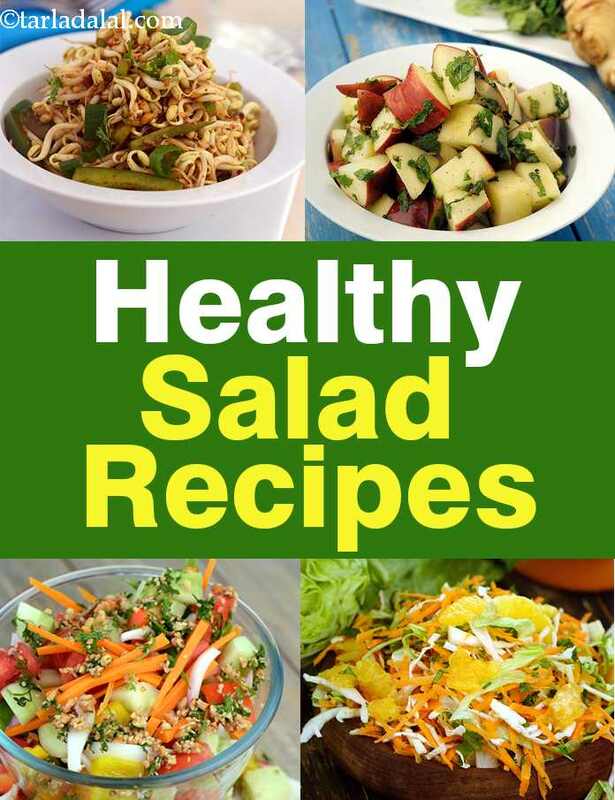 Enjoy our Healthy Salad Recipes, Indian Vegetarian Healthy Salad Recipes and other healthy salad articles below.